The Guardian Picture: In 2009, the crater of the extinct volcano Mount Bosavi, in the Eastern Highlands Province, PNG was found. 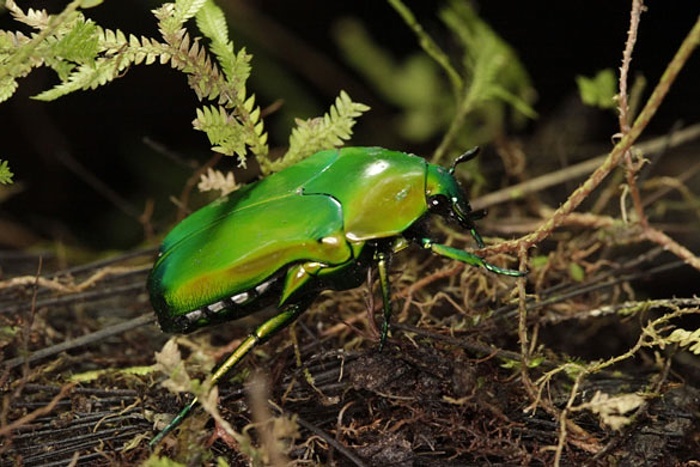 The green beetle pictured was one amongst many species discovered, except that this specie is iridescent. The green beetle is one of my favourites and the insect possesses a beautiful rainbow shine. The beetles come out in millions during fruit seasons. In Papua New Guinea beetles are eaten as food, but the green beetle is so beautiful that tribal dancers use the insect as part of their fashion. The fashion or their traditional dress, especially headbands and headdresses are worn in singsings. A singsing is a performance of song and dance by a group and it is one of many living rituals, handed down through generations. An Eastern Highlander (PNG) spotting a row of green beetle in his headdress. The beetles are woven intricately into the golden orchid fibre in diamond patterns. 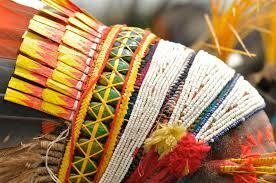 I have seen the beetles myself in Goroka, Eastern Highlands Province and found these ones on headdresses in Simbai, Madang Province, which prompted this post. 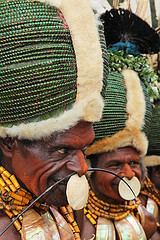 Simbai tribesmen (Madang, Papua New Guinea) wearing their fashionable head wigs made from the green beetle. 🙂 Thank you. I’m glad you enjoyed it. Fascinating to think that beetles could be so effective as decoration. But these beetles are very beautiful things. They do look amazing in those headdresses. What I’d give to watch a ‘singsing’. Oh you want to watch a singsing? May be one day when you come to Brisbane – it has to happen in September. The Papua New Guineans put on a big show here. Better to go to PNG. Malta! Wow! I went there in 1989 to visit my retired journalism lecturer and his wife. Alan and Jane. There were English. They moved there and bought a beautiful house with lost of rooms stacked in stone. I wish I could go back there – lost touch with them. They were in DarFraba (or something like that). We go there every year because we have a time share in an apartment in a hotel in Bougibba. We’ve had it for twelve years now. I love Valletta, which isn’t far away, and we also like to travel out to Gozo or sometimes Sicily. It’s just a nice relaxing week – plus lots of great historical sites and museums. I haven’t heard of DarFraba, so I’ll have to look that one up! There are just too many places to put on the ‘to visit’ list. I know I’ll never get to half of the ones I want to see. Still, I know I’m lucky to have travelled as much as I have. I would love to meet you, anytime, Joycelin. You are an amazing person and should be very proud of all your achievements. (And on top of everything else, you don’t make dozens of typos, like me!) I can’t wait for you to finish your Memoir, then I can read it in its entirety. Yes, travelling is very educational, as you know. I’ve seen a lot of geographical features first-hand, which does help when discussing them. Very interesting. Have you seen the BBC wildlife documentary, Lost Land of the Volcano? They visit the Mount Bosavi crater towards the end of the expedition – definitely a dream destination for me! Thank you Gordon. I have heard of the documentary and seen parts of it. I knew of the discovery before it was discovered – hahaha, got friends from Mt Bosavi (my son’s godmother). The discoveries were indeed very interesting. I have trekked close, but not into the crater. Yes – you should go, it would be amazing. Yeah you really did get a sense of just how pristine and remote it was and the reactions of the wildlife, such as a Tree Kangaroo, reflected that, bounding close to the crew as soon as they had arrived. Amazing to think it may never have seen humans before. Yes, it sounded totally untouched. I hope you get there. It would be very interesting.